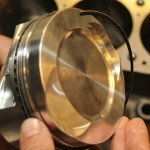 Mentor, Ohio: Wiseco, the eminent high-performance piston maker established in 1941, is launching a new range of diesel pistons for Dodge Cummins, GM Duramax and Ford Power Stroke engines. Using technology that should make a significant impact in the diesel performance world, the first two piston designs are devoted to Cummins 5.9 liter 12- and 24-valve engines and GM Duramax power units. These will be followed by new designs for Cummins 6.7 liter as well as various Ford Power Stroke models. The chief concern with cast aluminum factory pistons on high-performance diesel engines generating 850 to 1,000hp in street trim, and higher in truck-pulling and diesel drag racing, is premature failure. 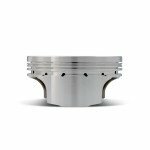 Alternatively, the shortcoming in high-output diesel engines with standard forged aluminum pistons can be soft, short-lived ring grooves. Wiseco’s solution is Armor Plate™. To the pistons’ most highly stressed areas—chiefly to the bowl, pin bores and ring grooves—Armor Plate adds hardness. In addition, engine building costs are eased, particularly the balancing process, by maintaining piston weights close to those of the original equipment units. Just as impressive is how Wiseco set about creating these new designs, collaborating with specialists in high-level competition. Adept at extracting the utmost from current diesel technology, Wiseco coupled their insight with their own piston-making expertise, which triggered studies of injector patterns and advanced bowl designs. The studies also brought remarkable weight savings for engines with internally balanced crankshafts. Custom units distinguish themselves with weights in the low 600g range, resulting in 30 percent net loss in piston mass, which prolongs crankshaft life by reducing twisting forces. 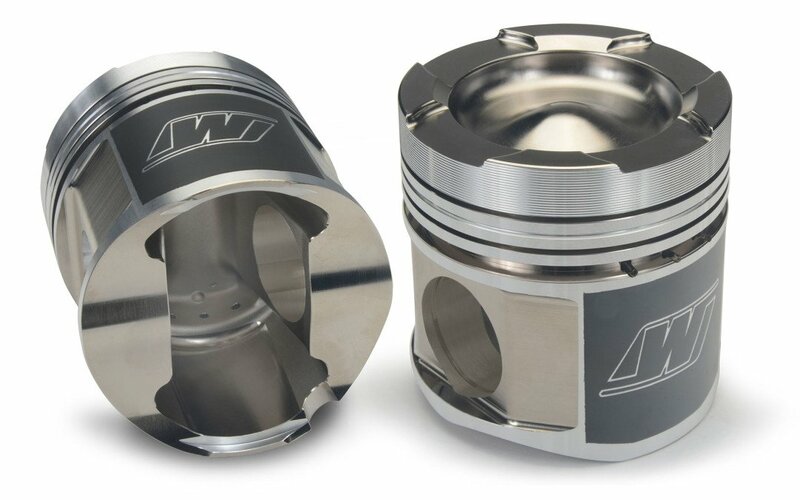 Because OEM piston pins enjoy a sound reputation for reliability and cost effectiveness, Wiseco designed their new pistons to accommodate standard pins. Interestingly, they introduce slots to the upper regions of the pin bores. 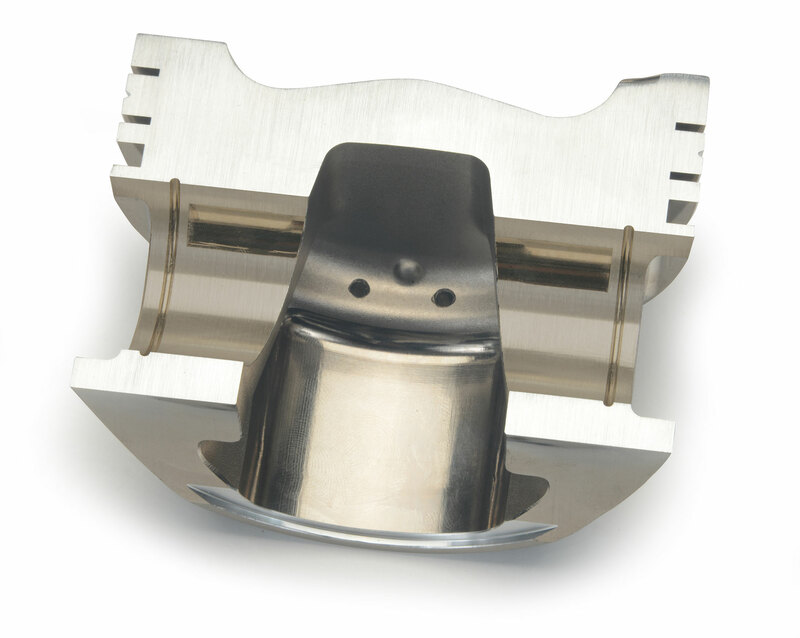 The slots prevent violent interference occurring between pin and bore, which could break the oil film and cause scuffing. In addition, ample channels are provided in the oil control grooves to drain oil back to the engine and thus avoid overpowering the rings. 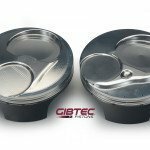 For efficient cold starting, a lubricious coating, Armor Glide™, is applied to the piston skirts to reduce friction. It is also seizure resistant and noted for its quiet operation. 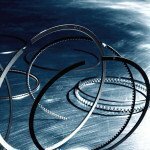 As for rings, standard 1/16th; 1/16th; 3/16th are put to use, exploiting today’s most popular materials which include cast iron, steel, tool steel or a nitrided stainless steel top ring with a ductile second. Importantly, Wiseco’s new diesel program accommodates large shelf-stock inventory as well as a rapid turn-around of custom units.